"Quick and delicious smoothie that can be used as a breakfast or snack!" 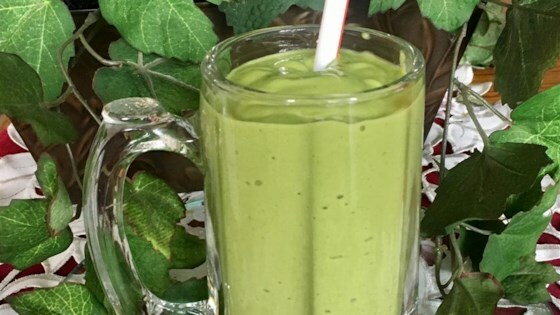 Blend banana, avocado, spinach, milk, ice cubes, honey, and vanilla extract together in a blender until smooth. If you'd like to make the smoothie sweeter just add more honey than what the original recipes says! Skim milk can be used in place of the 1% milk, if desired. Smooth and creamy, the vanilla is definitely a must! I used almond milk since I didn't have regular milk. Next time I might use less honey and more spinach. This was a little thicker than l like. Used soy milk in place of regular milk. Great smoothie! Not too sweet, very creamy and delicious. I used skimmed milk, otherwise kept to the recipe as is. Will definitely make again! Loved it! Made a few changes from the original, I was out of milk so I used to a bit of yogurt and water.. and I didn't put any honey in because I don't like it. Still takes amazing, loved it! Delicious - I left out the honey and still found it to be sweet enough! I'd give this refreshing drink 4.5 stars if I could. It's very good but not excellent as far as taste goes.